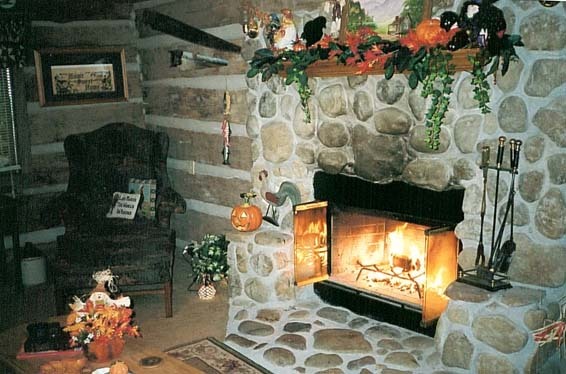 Our historical Homestead Cottage is a one hundred and fifty year old 2 story chestnut log cabin that has been lovingly restored in an effort to preserve it's rustic charm. Homestead Cottage borders the Great Smoky Mountains National Park near the Albright Trail, and is perfect for the hiking enthusiast. The Homestead Cottage has two and a half bedrooms and two full baths. The second bedroom is decorated with antique Eastlake furnishings, for those of you in the "know". or take a relaxing break in our luxurious heart shaped jacuzzi spa. Or if you prefer, wash away your worries in one of our clubfoot bathtubs! Enjoy sitting in our large sunroom, or take a stroll out to the porch for a relaxing rock on a swing. Either way you look at it, Homestead Cottage has that special touch for making your vacation dreams come true. It comfortably sleeps up to 7 people. Call to book Homestead Cottage for your next vacation!